The rate of unemployment in the United States is an important economic factor affected by global competition, education and demographics. The unemployment rate in 2014 was 6.2 percent, decreasing from 7.4 percent in 2013. Since 2010 (9.6 percent) the rate of unemployment in America decreased slightly. Thus, the rate was 8.9 percent in 2011 and 8.1 percent in 2012. 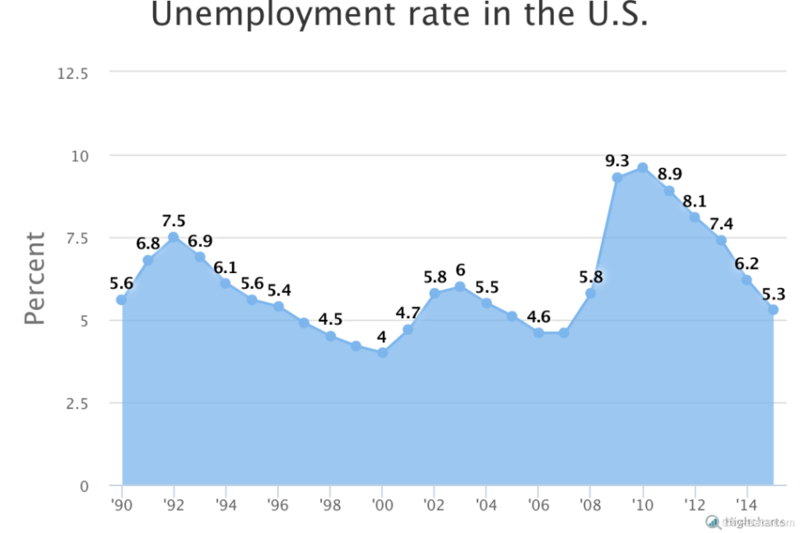 Notably, the highest rate of unemployment in 20 years was recorded in 2010. If we examine the monthly unemployment rate in the United States from December 2014 to December 2015 published at Statista.com, we can see that at the end of 2014 the rate was 5.6 percent. In January 2015, the rate had increased to 5.7 percent. The unemployment rates were the same in February and March: 5.5 percent. April saw a 5.4 percent unemployment rate. About 5.5 percent of Americans were unemployed in May, and 5.3 percent in June. July’s rate was the same as in June (5.3 percent). The numbers in August and September of 2015 were also the same: 5.1 percent. The rate then decreased to 5 percent in October and stayed the same for the last two months of the year. If we have a look at the monthly youth (16 to 24 years) unemployment rate in the United States, we can say that the rate showed quite a decrease from December 2014 to December 2015. The unemployment rate in December 2014 was 12.3 percent. It then decreased to 12.2 percent in January 2015. The rate of unemployed Americans in February was 11.8 percent, compared to 12.3 percent in March. April saw a youth unemployment rate of 11.6 percent, compared to 12.2 percent in June. 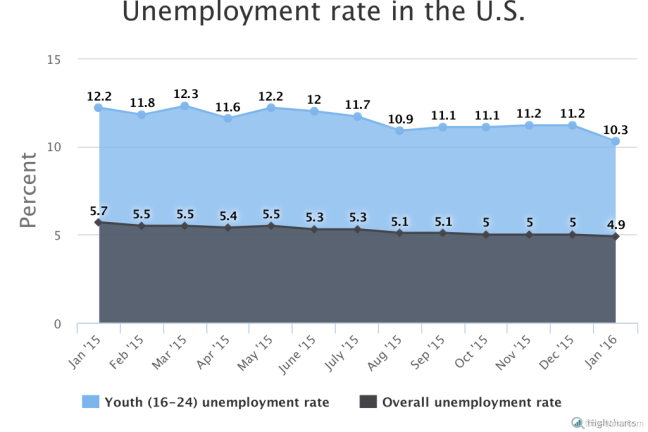 In July 2015 11.7 percent of young people were unemployed. The youth unemployment rate in August was almost 11 percent. In September it had increased to 11.1 percent, and held steady in October. In November 2015 the percentage of young unemployed Americans was 11.2 percent, which held through December. 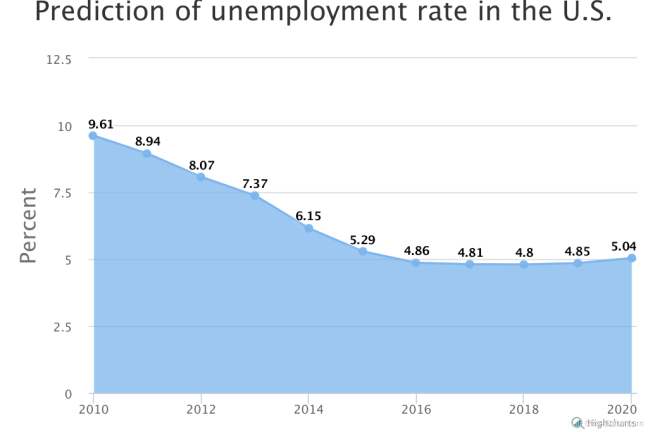 According to Statista.com and their projections of unemployment rate up until 2020, it is expected that the unemployment rate will further decrease in the next few years. It is predicted that the rate in 2016 will be 4.86 percent, compared to 5.28 percent in 2015. In 2017, the unemployment rate is projected at 4.81 percent. In 2018, the unemployment rate is estimated at approximately 4.8 percent. In 2019 and 2020 the unemployment rates are projected to be 4.85 percent and 5.04 percent respectively.